Obscure is not a bad word. It may be just be me but I feel a lot of "hot" geek lists recently have been populated by the usual top 50 suspects. Nothing wrong with that but I like BGG because it reveals to me games that I have never heard of or would never consider buying. To that end this is a list of games I own that I think are obscure or undervalued and should be looked at again. If any of these games actually have huge communities and dedicated fans I apologize that I haven't found you yet, I have a wife and two kids and a slow internet connection. Feel free to add your own candidates. A brutal game of trench warfare. The Poor Bl**dy Infantry are mere cannon fodder who exist in this game purely to die in large numbers. With the 100th anniversary of WW1 coming up it is definitely worth playing. I may be wrong but I think this game is overlooked because of the huge imbalance between the Soviet and German forces. Clearly this is historically accurate but may not make for the best game play. Having said that there aren't many games recreating this phase of WWII. It could be argued that the Spanish Civil War is a bit of a niche market but I am an fan. 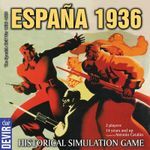 Espana 1936 has great components and good mechanisms and essentially is not a classic hex based war game. Civil war fun, is that a bad thing (well obviously yes but you know what I mean). I picked this up by accident many years ago and never really like it. But I can see that this is a very good, deep game that could be a winner if repacked and republished. A monster of a game if you play the full campaign but that is what we secretly like. I see other OOP Market Garden games going for silly money when this gem is overlooked. IMHO there is nothing missing from this re-creation. As the box says "a game of unnatural selection". I like to think of this game as the granddad of Dominant Species or Bios: Megafauna but I have played neither so I may be totally wrong. My copy is the Games Workshop version produced before GW became obsessed with elves, orcs and other such nonsense but that is another story. I hate racing games. They all seem to suffer from the same problems; fall behind and you have no chance, the early leader can't be caught, it's all just dice/randomness, too much down time etc. Leader 1 doesn't seem to suffer from any of those problems. It's a genuinely interesting racing simulation where the decision when to break away from the peloton is key, but also who to take with you when you do, whether you should try and break away with someone else and share the workload or whether you want to push on on your own. We've played this something like 10 times in the past six weeks since getting it and it's been a blast with everyone that's played. I'm going to refrain from adding any of my own publications, so here's someone else's obscurity: a Star Trek boardgame that's not centered around combat or trivia questions. Probably too long and chart-heavy for today's audience, the attempt to create adventure storylines via emergent random systems rather than paragraphs is sufficiently unique to merit a look, especially since Star Explorer is now available once again through Goblinoid Games. This game is obscure. Anyone know where can I find it? I recently found this game on clearance and looked it up on BGG and was interested in what I read and the VERY enthusiastic crowd around this game (the $10 price tag didn't hurt things either!). I purchased this and I absolutely love this game! It isn't the deepest of "miniature" type games but I can get someone who has never played 40k, Warmachine, Hordes, et al. and have them up to speed and enjoying this in no time at all. It also has enough depth to make it to the table with semi-regularity and with all of the fan made and "official" scenarios and expansions there is actually quite a bit here to play with! I believe with Heroes of Normandie upcoming release this may get a small resurgence in popularity, but from what I have heard, though similar, the games are not very much alike. From the game..."An exceptionally strange game of exploding children and their cheerfully homicidal baby-sitter in a really alien playpen." 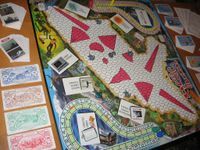 Castle was one of the early "Designer" games I picked up, and I got it for a steal. I'm not sure how obscure it is, but it does seem to be out of print. This is a lot of fun; allows for some friendly competition, and even perhaps a little backstabbing! Simply the best ever Steampunk-esque adventure board game. Variable board setup, paragraph driven, character developement and multiple ways to victory / storylines. I won't lie: The game is not without problems. However: The problems are relativly small and can easily be overcome by house-ruling. The fun to be had plying the game far outweight the minor problem. The only mayor drawback is the games availability. That said there have been repeated attemps to bet this reprinted. It might help to shoot the designer Martyn Oliver (active on BGG) a geek-mail to this regard. I bought this in my first (and last so far) visit in Scotland. My copy is signed by the designer and I am very glad to own it. Designer does tours at Loch Ness.